Let it be known. I AM NOT A COFFEE EXPERT. I am a coffee enthusiast, with a fiancee (almost husband in 3 weeks!) who is learning a ton about roasting right now. I learn a lot through him (i.e. reading his books when I'm bored). I used to work as a barista back in college. So I have some muscle memory for foaming milk and pulling a proper shot of espresso. By now I know the difference between the roasts, and I know which ones I prefer. So, yeah, I'm not claiming to know the science behind the perfect latte foam. But in a lot of ways I feel close to expert on alternative milks, having given up cow dairy for various reasons in 2011. I've tried all the milks, and most of the brands. I've made most alternative milks at home. And I've tried all of them in coffee. So, as your resident-self-proclaimed-alternative-milk-pro here's my judgement of non dairy milks from not awesome to awesome on the "is this going to be good in my coffee?" scale: soy milk, brazil nut milk, oat milk, almond milk, cashew milk, coconut milk. That's personal preference, of course. I'm sure there are big advocates for soy in coffee -- especially "soy creamer" products. But I'm talking about straight up milk, with no additives. The way you might make it at home -- water + bean/nut/coconut blended together and then strained or pressed to get all of that good milky liquid out. All of those milks work in coffee, it's just that some are richer, creamier, sweeter, and more flavorful than others. Which all in all makes a better latte or cappuccino. I mean, if your creamer isn't best quality what's the point of mixing it with great quality coffee? I got this cappuccino machine recently (courtesy of Staples for National Coffee Day) and it's been a real fun toy to have around the house. Logan had never had espresso before, or any drink with espresso in it. It was awesome getting to make his first latte for him. And being able to use a non-dairy milk that really acts like proper milk means he got to try something close to the real thing! The natural sugars present in coconut milk combined with the protein and fat content make it a pretty good substitute in classic milk and cream coffee drinks. It's not exactly the same -- coconut milk is lower in sugar and protein and has a much higher fat content than whole milk. It steams and foams up differently than milk does, as you might imagine. However, you still get quite a nice micro foam -- albeit that it's a pretty dry foam like in skim milk. I used canned light coconut milk for this latte adventure (Thai Kitchen brand) so that may be the cause of the dry foam. 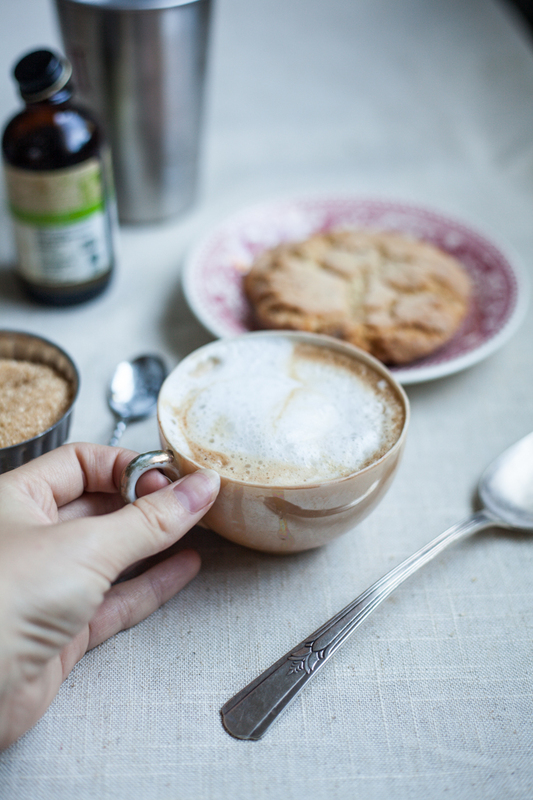 It practically doesn't need to be said, but serving your latte with a big ol' gluten free sugar cookie is always a good idea. For National Coffee Day today I'm teaming up with Staples to give away about $600 worth of coffee goodies on twitter! There are three opportunities to win a Kurig or a Cappuccino machine plus lots of other coffee prizes. Check my feed at 9AM, 1PM, and 3PM and simply RT and respond to be entered. Brew 2 shots of espresso, and pour in the milk slowly until your mug is filled about ¾ of the way with milk. Pour or scoop out your foam over your latte. Add sugar or vanilla syrup, to taste. Alternatively, heat your coconut milk in a small pot over high heat to minimum 135'F and max 160'F. Foam your milk using an electric milk frother according to package instructions. It's pretty similar to a steam wand -- keep the electric "beater" below the surface to froth the milk and create air bubbles. Combine your milk with your espresso as explained above.